1st January 2011 saw the introduction of an electronic payment system (SPE-CDNI) for the collection and disposal of oily and greasy waste resulting from the operation of vessels. The disposal of this waste is financed by a disposal charge paid by the vessel’s operator. Payment of this charge requires the opening of an ECO account which is the key to accessing the SPE-CDNI. The ECO-account is opened by the vessel’s operator or owner with the national institution (IN) of his choice. Opening the account is preceded by completion of a registration form. Upon receiving the form, the NI will create an ECO-account and link a card (or several cards) to it. The opening of the ECO-account will enable the vessel’s operator or owner to credit his ECO-account with sufficient funds to cover subsequent disposal charges. The payment is to be made to the NI’s bank account; the NI will ensure that the information on the amounts collected is immediately sent to the SPE-CDNI, then transferred to the depositor’s or account holder’s ECO-account. Once this data has been registered in the SPE-CDNI, the amount paid in will be available, for payment of the disposal charge, when purchasing gas oil anywhere within the CDNI’s area of application. Any unused credit may be returned to the depositor at any time. All users can consult their ECO-account online. The ECO-account bears the name of the vessel’s operator and/or owner. The ECO-card on the other hand is linked to the vessel. The ECO-card enables boatmasters to pay the disposal charge every time they bunker with zero-rated gas oil. Payment of this charge will confer access rights and enable oily and greasy waste to be freely deposited at the reception stations that are planned throughout the territory covered by the Convention. The ECO-card is the the second component of the SPE-CDNI. It is the direct link between the ECO-account and the vessel. The ECO-card is used to charge the payment of the disposal charge to the ECO-account in question. The bunkering station uses a mobile electronic terminal to process the transaction. To this end, the boatmaster presents his ECO card to the bunkering station during the bunkering process. This system ensures that the account can only be debited upon presentation of a valid ECO-card and if there are sufficient funds. 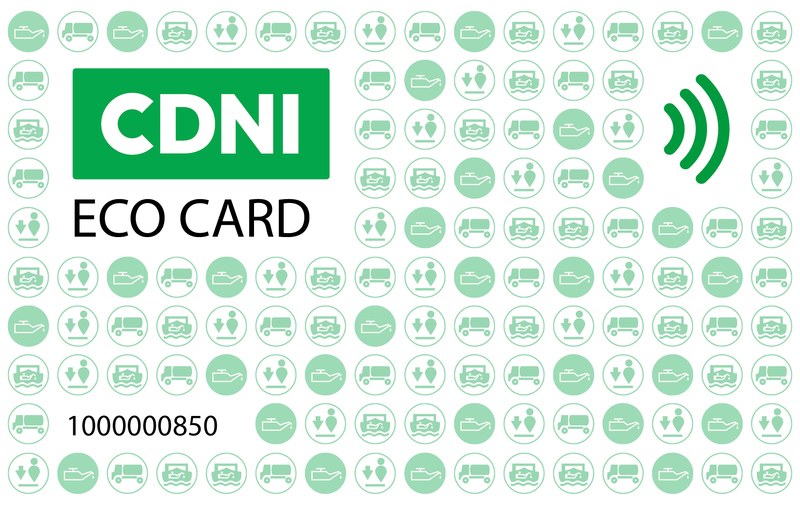 A new ECO-card will be rolled out throughout the network by March 2019. The new-look ECO-card is being modernised and incorporates “contactless” functionality. It can also be used for other inland navigation applications and services (payment of port fees, use of waste containers, opening doors, obtaining electricity or drinking water ashore…). For more information on use by third-party systems and how to receive this service, please contact the CDNI Secretariat (secretariat@cdni-iwt.org).